Client: IFA Hotels & Resorts L.L.C. 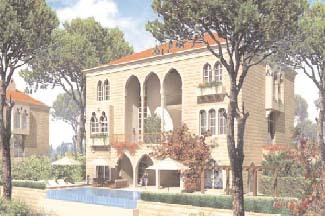 The project is a high-class residential project on 83000 m2 with a built-up area of approximately 80000 m2, comprising an eclectic mix of private villas, townhouses, village residence and a tower residence, all offering major recreational facilities. 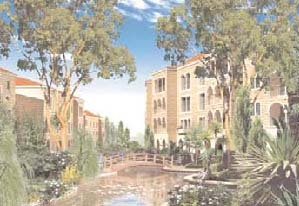 The project features tennis courts, swimming pools, and clubhouse spa and beauty clinic. Al Abadiyah Hills Resort is located in one of the most delightful summer resort areas of Lebanon at a 1,000m altitude and near the summer resort towns of Aley and Bhamdoun. The resort overlooks impressive mountains and the picturesque Green Lamartine Valley, in what is considered to be the most attractive summertime haven in the Middle East, and is only 30 minutes from Beirut International Airport. Europe, with a portfolio spreading throughout Europe, Middle East, Africa, South America and Asia. Design review, preparation of tender and contract documents, construction supervision and project management.